/ Culture / Jallikattu- A cultural ideal we desire? Hundreds of thousands of protesters poured out on Marina beach in Chennai in January to protest against the ban on Jallikattu in Tamil Nadu. There was sloganeering against the political establishment at the Center and the state. The media reported that the protesters were mainly youth, college going students and intellectuals making it ‘people’s movement’ (Janardhanan, 2017). Various issues were raised, all viewed as hurting Tamil pride and culture. But Jallikattu remained at the core of the protests. The state witnessed such massive ‘spontaneous’ unprecedented protests. The implications of this reaction must be discerned more comprehensively. There is a lot written about Jallikattu from two different perspectives. One is about the cruelty meted out to the bulls involved and how it can’t be ethical normative precedent for our society. Other argument is how Jallikattu is part of Tamil tradition and now of Tamil identity and pride. While both arguments are built on a number of facts, arguments and counter arguments, it is important to dwell deeper into the sport, the ban and the subsequent ordinance by BJP government at the Center to analyze these issues beyond the pivot points of animal cruelty or traditions/ culture. Jallikattu is also a signifies the culture we want in our society. Do we want a culture steeped in violent and masculine ideas of entertainment at the cost of mute, helpless, tortured animals or a peaceful inclusive society based on the values of compassion and equality? This is the framework this article wants to adopt while examining the issue of Jallikattu and the related politics. Jallikattu is a sport where a bull is let loose and the males compete to hold on to the hump of the bull and go a particular distance. The winner gets a bag of money attached to the hump of the bull. In order to make the sport exciting and giving it heroic proportions, the bull are infuriated and made more aggressive by prodding them with sharp objects like spears, bitten, tails mutilated, bitten or twisted, chilli powder put in their eyes, the bulls are dragged by the ropes in their nose which leads to bleeding and administered alcohol. This makes the bull agitated and dangerous adding more adrenaline factor and attaching the notion of male valor to it (The Wire, 2017). Looking at the gruesome treatment meted out to the bulls, the Supreme Court in 2014 had banned the sport along with other similar sports like rekla, kambala and manjuvirattu. But there have been persistent demands for continuing of the sport. 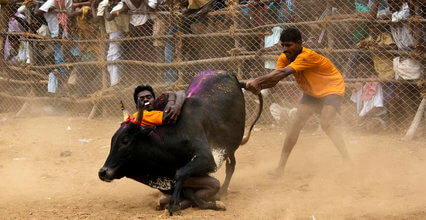 The Central government issued an ordinance which allowed Jallikattu to be held albeit some restrictions. This was challenged in the Supreme Court by animal activists and the Supreme Court stayed the notification. This led the Tamil Nadu State Assembly to pass amendments in the Prevention of Cruelty Act of 1960 to allow Jallikattu. Emboldened by the protests against the ban and the Center government giving into it, there are similar demands from other states like Maharashtra and Karnataka to legalise bullock cart races and kambala. Arguments for Jallikattu range from how it contributes to protecting native breeds from extinction to how it is central to Tamil identity! Not only is Jallikattu symbolic of patriarchy prevalent in our society but also symbolic of a caste ridden society. A strong voice of protest has emerged from the Dalit community in Tamil Nadu which points out that Jallikattu has a caste character and is a vestige of caste divided society. Jallikattu still takes place in districts where caste Hindus are dominant. Dalit youth who attempt to participate in the sport are attacked (Yamunan, 2017). If the bull is tamed by Dalits it leads to clashes. Even as spectators they have to stand only in the earmarked area and are forbidden to share the same space with other caste Hindus(Indian Express, 2017). How can Jallikattu become the mascot of Tamil identity when a large section of the Tamil society has been excluded from the practice and is penalized for their participation? The Dalits view Jallikattu as one of the instruments to reinforce the already deeply entrenched caste hegemonies by claiming it to be part of Tamil culture.